Gotta say, these are poses we never really see in the artwork, so that's cool! But man, to make me spend the kind of money they've been asking lately, it'd have to be one that looks like normal Zero (no W, normal eyes),but switches over to Maverick Zero (aura, W on head gem, purple eyes, the works) when you flip the switch on the Exclusive Version. the sketches look great, but First 4 figures make such ugly figures. They always mess up the face and necks in ways that make them just awful to look at. I'm fine with any of these poses so long as they get the face right for once. C looks a lot like the top portion one of the Sigma heads from his final form in X4. I would vote C just for the Sigma Head model. They look nice and all, but F4F makes statues that simply aren't worth 200+. Shame that 4f4 gets so many properties that I'm interested in, but their stairs are often really stuff posing and the faces are horrid, at least with Mega Man. They don't seem to understand the anatomy and how the body should move and the faces are always flat and squished in the helmet. 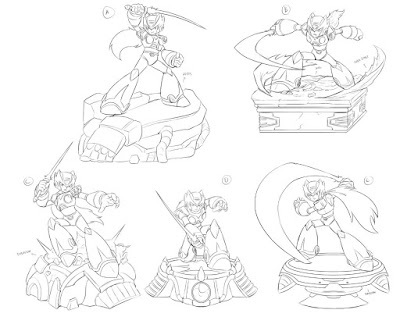 Didn't they already make a Zero statue or was that cancelled?